Every woman wants to marry him, but what if he is already taken? 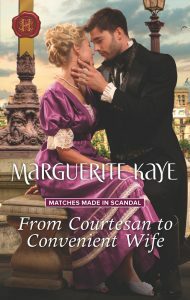 Jean-Luc Bauduin, Parisian society’s most eligible bachelor, is determined to take only a wife of his choosing. But until that day comes, he’ll ward off his admirers by hiring Lady Sophia Acton to wear his ring. The passion Jean-Luc shares with his convenient bride is enormously satisfying—until he discovers Sophia’s utterly scandalous past! You can follow in Sophia and Jean-Luc’s footsteps in a romantic walk through Paris here.